I wrote a post about an article - even if you ignore my post; please read the linked article. I read an article this morning that I think you should also read...to be honest, EVERYONE needs to read it and then actually buy into the concept because I think, if this takes off, it could revolutionize the world as we know it. The company, Terracycle, is promoting a new shopping platform called Loop, which plans to do away with disposable containers - like shampoo bottles, laundry detergent, etc. They are partnering with major manufacturers to deliver the products in reusable containers. And, once those products are used they will pick up, clean and re-fill the the containers and send them on to the next customer. "We're going back to the milkman model of the 1950s. You buy the milk but the milk company owns the bottle, which you leave in the milk box to be picked up when you're done with it." How awesome is this concept? In my opinion, it is EXTREMELY awesome! They are set to begin test marketing in key areas this spring. I can't wait until they actually launch here because I am SO there for this initiative. Truth be told, I wrote this post months ago and just left it to languish in my Drafts folder - but today, Man-Child and I had a conversation that reminded me of this draft. So I did a little more exploring and discovered that you can sign up for the wait-list so that when/if the program is rolled out in your area you will be informed. A brownie is a brownie is a brownie...or is it? Last weekend, I asked The Husband to pick up two boxes of brownie mix. 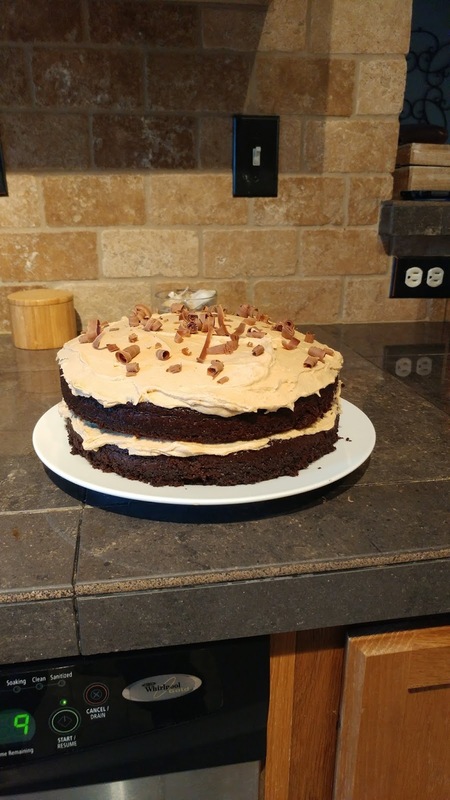 I had planned on making brownies for our car guy as he was going to work on my car, on his day off no less, and that's just one of the many reasons he is our car guy. The other mix was just to have on hand for when the next "brownie emergency" cropped up. What, you don't have "brownie emergencies?" Now, knowing that I make all of my cookies and most of my cakes from scratch - you are probably wondering why I don't make brownies from scratch. And there is a reason. It's quite possibly the STUPIDEST reason in the world. . . It's because I don't keep cocoa powder on hand. Why? Probably because most of the cookies or cakes in general rotation around here don't call for it. Generally, I keep plenty of those ingredients on hand...but not cocoa powder. At any rate, I sent The Husband off with no further instruction as to what buy other than "brownie mix." To be honest, I figured he would come home with the cheapest brownie mix he could find. Which was fine by me because a brownie mix is a brownie mix, right? At least, I used to think that. 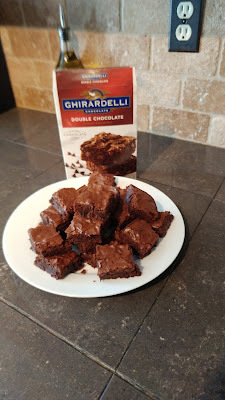 He came home with two boxes of Ghirardelli Double Chocolate brownie mix with chocolate chips. And I am just here to tell you that, hands down, this mix kills the myth that a brownie is a brownie. Of course, I would never turn down a brownie that was whipped up from another mix, because brownies are delicious. But these brownies? Oh, so heavenly. And I can confirm our car guy thoroughly enjoyed his batch. Man-Child dropped by after I had already passed the brownies on to the car guy and as he was walking in he noticed the empty box in the recycling container and, literally, the first words out his mouth was "Where are the brownies?" 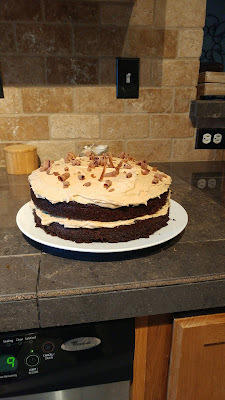 So I promised to make him some this weekend. See? I knew a "brownie emergency" was imminent. But now that I see, in writing, how stupid my reason is for not making homemade brownies, I will promptly buy a can of cocoa powder and await the next "brownie emergency" so I can try my hand at homemade brownies. In the meantime, take my word for it, if you need a brownie mix this one is fabulous. Now about that pie crust that I also don't make from scratch - well, that will never happen because no matter how hard I try, I just cannot master that. Not sponsored in any way, shape or form. Promise. Fun fact: Did you know my oven racks aren't actually black? Me either. Considering all the things I wanted to get done today; mentioned here - plus all the things that weren't on that particular list but reside on my constant, ever running, To Do list, the list was monumental. One of the things that I wanted to do today was clean the kitchen sink. We have a double, white porcelain sink. When it is clean, it is a thing of beauty. When it isn't, it is hellish, and no matter how clean the rest of the house is - if that sink isn't clean the whole house doesn't feel clean. And considering how many messes The Husband makes in that kitchen, it feels like that sink is always in need of a scrubbing. So I cleaned it and I was pleased. The Husband had dropped a hint before he left that "if I had any free time and loved him, I would clean out the refrigerator for him." This is the chore that he hates the most, even more than emptying the dishwasher. I think it hurts him to see all the food that he has prepared thrown in the trash. Well, that's his own fault for creating more than the two of us could possibly eat. Now, to be fair, a LOT of the food he makes, he takes to work to share with his co-workers - or, if I'm quick enough, I take a small bit for a few of my favorite co-workers. Then, because "I love him and I had a little time," I cleaned the refrigerator from top to bottom and discovered that we have more carrots than any one house needs. We don't even eat that many carrots! So, I am at a loss as to why we have so many. Now here is where I mention that the Lazy Genius' hack to vacuuming out the fridge IS genius! Cleaned those drawers in no time flat. My day then got totally side-tracked when I noticed just how disgusting the oven glass was and, on a whim, decided that on this gorgeous, sun-drenched day, that I would clean the stupid oven. I need a Lazy Genius guide to dealing with that. Now, I know that our oven is self-cleaning but I was wary about using it as it appears our oven has NEVER, EVER been cleaned. And, I also know that the more you can get out before you start the self-clean then, supposedly, the less toxic the fumes are (or is that all just in my head? Probably). At any rate, I started with the oven door. Not long after I started, my friend from two doors down called and reminded me that we are all getting together tomorrow for her youngest's second, and her husband's (I have no idea how old he is, I'll find out tomorrow), birthday. Naturally, this set off alarm bells in my head...GIFTS. I needed to get gifts. And lunch. Two stops and a lunch later, I came home to finish cleaning the oven door. Guess what I decided halfway through cleaning the oven door? That The Husband can clean the actual oven. Dear God, that was a nightmare. At one point, I stopped and Googled "easiest way to clean a gross oven door." One woman suggested that one wet and one dry Mr. Clean Eraser worked for her. Also, her "dirty" oven door looked suspiciously cleaner to begin with - but I tried it. It did not work. Bob Vila told me to use baking soda and vinegar - so basically, the exact same method I used - to make a paste and let it sit. He did mention, that a razor could come in handy to remove those "extra tough" bits of grease and grime. While I did not have a razor handy (plus, I would have worried about slicing myself to ribbons) I did have a butter knife. You would be surprised at how much gunk a butter knife can remove from oven glass...I sure was. After I wiped the glass clean one last time, I stood up, turned around and was faced with the oven racks. Being the "genius" that I am, I figured I would pop those in the dishwasher and call it a day. They didn't fit in the dishwasher. And, I knew from my previous research, that these needed to be cleaned outside the self-cleaning oven. Here is what I now know, when my dishwasher dies and I need a new one, I will be taking an oven rack with me to purchase the next one. And I will find one that can hold an oven rack. Cleaning an oven rack, by hand, has to be hands down, one of the world's most tedious tasks. And, imagine my surprise when I realized that yes, my oven racks AREN'T black! You can also now imagine that my oven racks still have bits of grease and grime because no amount of "elbow grease" can remove that - as my very sore fingers can attest. Also? Perfectly good manicure; ruined. And that clean, white sink? Had to be re-cleaned. So to recap - today I cleaned the sink, the refrigerator, the oven glass and racks, and the sink again. That is a total of five whole tasks...which took all day. I have a feeling that if I want to complete the other nine tasks on that To Do list, I may need to get up at 3:00 am. And, just I was wrapping up this post, Tipsy Swistle popped into my head and reminded me how much Future Gigi is so grateful for something Past Gigi has done. So, Today's Gigi got up and crossed four more tasks off the list - things that Future Gigi will be so relieved are done. One of the things accomplished? Changing the sheets on the bed. This is shocking only because I usually change the sheets in the morning. Now, it should be told that I ADORE clean sheets so much that I would change them every day if I could. But I HATE changing the sheets. Why? Because our mattress is ridiculously heavy. And, to my thinking, if the mattress is THAT heavy then why do they already have body-shaped ruts in them after only X amount of years (I thought I had posted when we bought a new mattress, but apparently not. I'm thinking maybe six years ago?). But, whatever, that chore is done. And instead of spending the whole day waiting to crawl into a bed with clean sheets, I only have to wait until this post is done. Delicious. Isn't it funny though, how you envision your day (or weekend) one way, only to get totally waylaid and end up going in a different direction? Two weekends ago, I practically, single-handedly moved Man-Child. His roommate needed to move back home to help his parents out. So Man-Child needed to move to a smaller, cheaper apartment. We had told him he could just come home but after that taste of freedom plus the hour (or more) long commute had him turning down our offer to coddle him just a tiny bit more. When The Husband and I arrived to assist, the boys had already moved all the heavy furniture (thank God!) but had neglected to actually pack anything - which immediately became my priority somehow. Luckily, they didn't have nearly 50 years of living under their belts to pack. Once the majority of stuff was moved, The Husband headed off to greener pastures while I stayed beyond to unpack and "organize." Whereupon, I was promptly informed by Man-Child that I had packed most of his roommates belongings...OOPS. At any rate, by that Sunday afternoon, I pretty much had him squared away. Sure he needs a few things, but mainly his apartment is livable. All that to say that The Husband and Man-Child are both headed to Asheville this weekend to help The Husband's daughter move. Do I feel a small twinge of guilt about not assisting? Yes. Yes, I do. But on the other hand, I spent an entire weekend just moving one child. 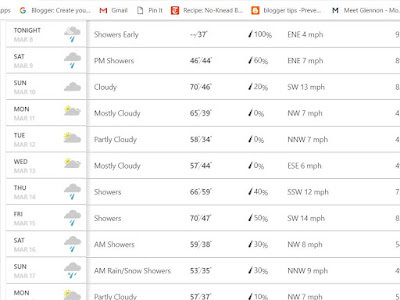 Not to mention all the things I want need to get done around here on the first rain free (hopefully, at this point I don't trust the forecasts AT ALL!) weekend in memory. Either way it will be quiet and no one will be asking anything of me...I hope. As mentioned in my last post, today Man-Child and I had a date to see Clue: The Musical. We decided that we would meet at a local Irish pub for lunch prior to the show. We both really enjoy this pub and the food is always delicious. We agreed to rendezvous at noon, since this place is usually pretty packed and we assumed it would take some time to get our food, etc. While the food WAS delicious, I was a little disappointed that on Sunday's they now only serve a brunch menu - my stomach was all set for some fish and chips - but I settled on shrimp and grits and it was yummy, but it wasn't fish and chips. Why are a lot of restaurants only serving brunch on Sunday now? I'm assuming because it's a smaller menu that means they can get the food out faster. We had ordered, eaten and was out the door in less than an hour. Which meant that we had a little over an hour to kill before the show. So we wandered down the street to a local bookstore to browse. Every time we go downtown, we always encounter a few eccentric people. Today was no exception. We meandered in and out of several shops, killing time. Although, quite a few of the shops were closed - which is kind of surprising considering how the city is always trying to promote downtown and there were tons of people out and about. Around 2:00 pm we headed to the theater - I had only been to this theater once before and had forgotten how small it was - which isn't a bad thing. On the contrary, there isn't one bad seat in the place. The show was perfection! We laughed through the entire performance. The cast was spot on and nailed their roles. I adore community theater and admire the effort that is put into each and every production. They were rewarded with a full house - not an empty seat was to be had. There was a family in front of us with some younger children. And I could feel the mother cringe during one scene that was a little risque - but hopefully that humor sailed right over their sweet heads. If this play comes to your area, I would highly recommend that you attend; you won't be disappointed. And, Ernie? This movie is considered a "sleeper" in that it bombed in the theaters but developed a cult following after it was released to video. I also just discovered that there is also a series of children's books based on the movie. Occasionally, just for laughs, I will check airfare to go home to Houston for a visit. The other day, out of curiosity, I checked the fares during Man-Child's Spring Break. Only to be pleasantly surprised by the price. Granted, I would have to drive to Charlotte to fly non-stop but completely doable. I texted my dear friend to make sure the dates worked for her - they did. So I booked the tickets and am currently headed home in about three weeks for about 5 days. Between the anticipation of this trip and the lovely tulips that I bought this afternoon, I can almost ignore the fact that the weather forecast for the next ten days is nothing but rain and clouds...almost. I swear the rain has been unrelenting for the last few months. 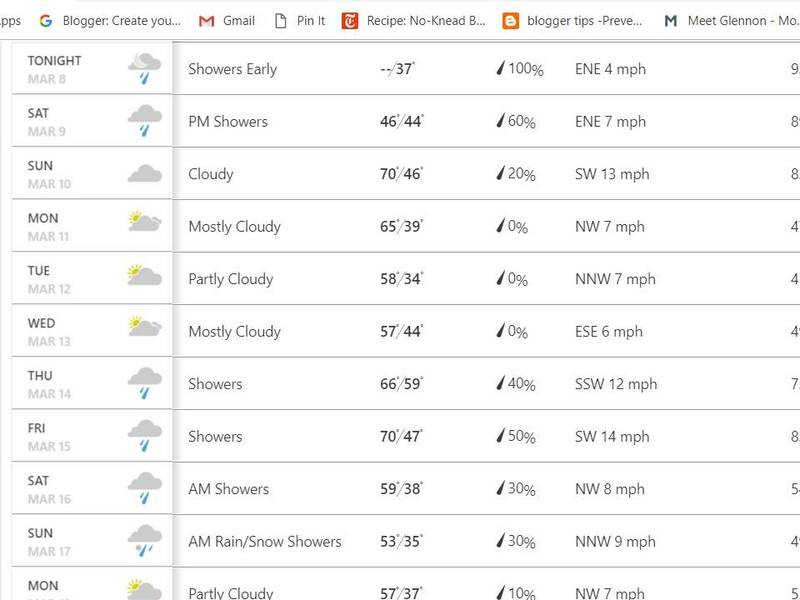 I recall reading an article at the end of December that declared that we had exceeded the amount of rain in Seattle by the end of 2018. I already know that days on days of gray, gloomy, rainy days bring me down; but now I am hearing from others that aren't usually so affected that they are being brought down by the weather also. I'm seriously beginning to think I need a solar lamp. The only other thing that I'm anticipating this weekend is that Man-Child and I are attending a play on Sunday that we are both anxious to see - Clue: The Musical. Clue is quite simply one of Man-Child's favorite movies of all time, actually the entire family loves this movie. It is, of course, based on the board game. So when we discovered that a local theater was putting on the show, we promptly bought tickets. It's a very campy show and so fun - I expect that we will completely forget about the rain while we enjoy the show, I hope.